Louis Prang (1824-1909) was born in Germany and immigrated to the United States in 1850. He was industrious and attempted to earn a living as an architect, leather manufacturer, and wood engraver. 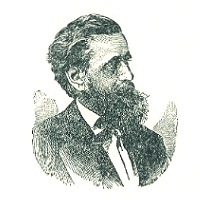 In about 1856, he opened a lithography shop in Boston. A lithographic print is produced when a metal plate is stamped against paper card stock. The image area of the plate is chemically treated to attract ink, while the other areas are treated to repel ink. Multiple strikes are made with different colors to replicate the image on paper. Prang mastered the process of chromo-lithography, and his prints were often indistinguishable from the original works. His earlier lithographs were reproductions of oil paintings and water landscapes. The first Christmas cards in history were produced in England in the 1840s. In 1875, Prang published the first American Christmas card from his shop in Boston. By the 1880s, Prang operated a very successful greeting card business. He often considered his greeting cards works of art, with distinguished coloring, lettering, and card stock. Prang even conducted contests for works of art, which were decided by juries of prominent artists of the day. By the 1890s, his cards were internationally renowned. Louis Prang greatly influenced the next generation of greeting card publishers, including Fred Rust who founded Rust Craft Publishers. Prang set the standard for the beautiful Victorian cards of 1900-1920. 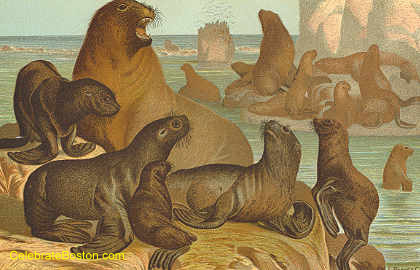 Below is a fine example of a Prang lithograph entitled "Sea Lion."